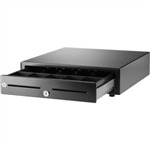 Whether you’re looking for a cash drawer insert to use in conjunction with your POS till, or a cash box to keep the day or week’s earnings safe and secure overnight, NetNest has a wide range of equipment to help you keep your notes and coins organised and easy to access whenever you need. Browse our full range and order online for fast and affordable delivery. Cash tills and accompanying cash drawers are one of the most important pieces of equipment to invest in if you run a retail business which operates bricks-and-mortar stores. 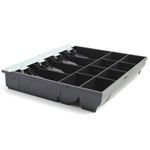 Our cash register drawers are all constructed using the sturdiest, highest quality materials to ensure longevity, efficiency and complete security of your cash. We also stock a wide range of accessories, such as lock and key sets, brackets, and cash register covers to keep your equipment looking and functioning like new.